More about baths. Yes, we like our baths at Dream Chase Farm. Not just the unexpected baths when Special Ring or Popcorn Deelites splatters an unsuspecting tour from their favorite rain puddle. 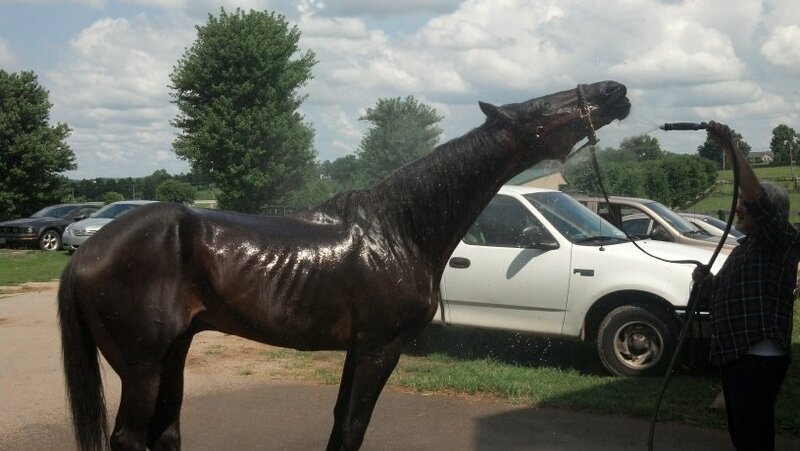 And not just the accidental baths we get when we clean the horses’ waterers enthusiastically. Or even the green and orange baths that occasionally spray Danthebluegrassman’s visitors when Dan eats his carrots (and Flick’s too, if can get them) too fast and eagerly. 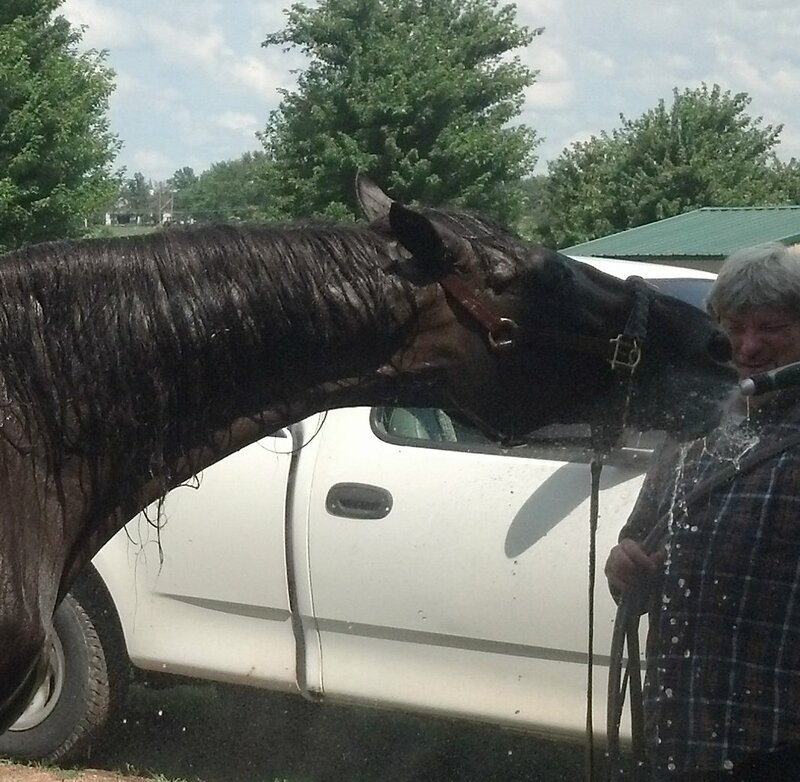 Our favorite baths, horse and human alike, are when we help relieve the heat and itchies of a hot, humid day like today has been, by giving a horse a refreshing shower. We now have a bathing station at the back of the small barn and another one in front of the big barn for conveniently and safely treating the minor injuries and localized infections common with horses, and of course, for easy, enjoyable baths. Even those who don’t like sloshing water—for instance, Ogygian who has refused sponge baths for years, welcome the gentle spray from a hose, shampoo, and then you may use a sponge, thank you—that was a routine part of the intensive care and attention they got when they were young race horses and breeding horses. Most of our residents let us know they’re happy with the freedom of retirement, but most still enjoy getting familiar, pleasurable attentions. Ogygian liked his bath better than getting his picture taken. Photo by Tim Wilson. Wallenda gets a bath. Photo by John Bradley. Wallenda’s thriving despite old ligament and hoof issues is a testament to the excellent care he’s received our podiatrist, vets, staff, and most of all his own toughness and intelligence. He gets turn-out time every day that weather permits, but he must spend more time in a stall than most. For him, especially, a little jaunt out of the barn for a bath can make a hot day pleasurable. Shower water is fun to drink, too. Photo by John Bradley. Apologies for a month and a half of silence. More has been going on this summer than ever before. Volunteer responsibilities, and our need for volunteers, have grown. We’re all working hard. Fortunately, there’s the newsletter, Viv has steadfastly reported on Facebook, and we’re excited that some of our horses have taken to Twitter. You can follow the tweets of Afternoon Deelites, the pithy comments of Little Silver Charm, and blasts from our residents’ pasts from farm historian Rail Trip. OF’s communications have never been so plentiful and timely. Still, a blog’s leisurely reflections have their place too, and I regret that I’ve fallen behind. I’ll post some brief notes over the next weeks to catch up. But first, and most important, some words about Prized, for whom no words are adequate. 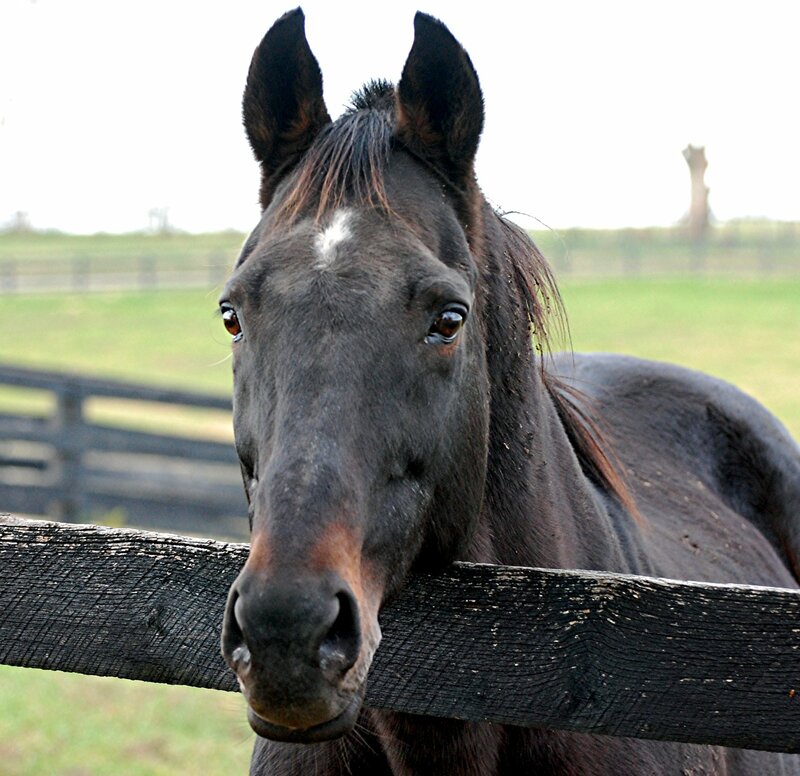 When he passed last Sunday at 28 years old, he’d had mobility issues for some time. That is, his hindquarters slowly lost the ability and strength to respond to his will. On Sunday morning he couldn’t get up, and Michael and Dr. Bryan Waldridge made the only kind decision left to make. 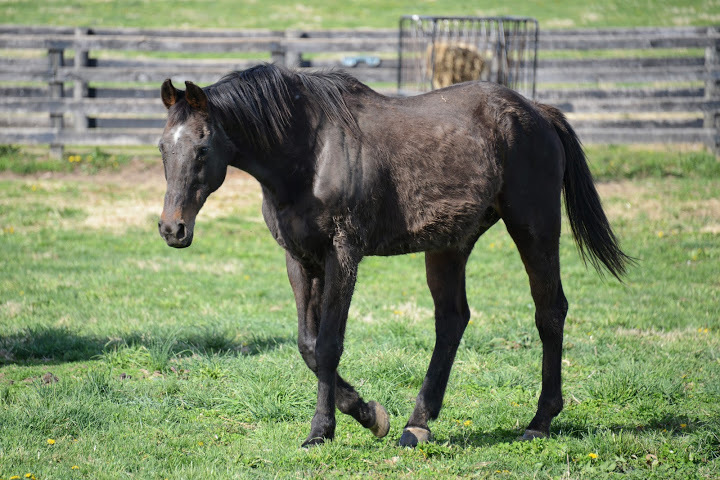 You can read about Prized’s accomplishments in his obituary, or the articles in the Daily Racing Form and Blood-Horse, how he outran Sunday Silence in the 1989 Swaps Stakes, how he won that year’s Breeder’s Cup Turf in his first ever start on grass. Let’s see any horse equal that feat. How he sired the grand old gelding Brass Hat and was damsire of Paddy O’Prado, Romance Is Diane and this year’s Oaks winner Untapable, who just may be the best 3 year old in America. To that I can’t add much, but I want to share a little about my last weeks with Prized. I’m not the main person, or the only one, who helped take care of him in his final months. The part I played was relatively small. 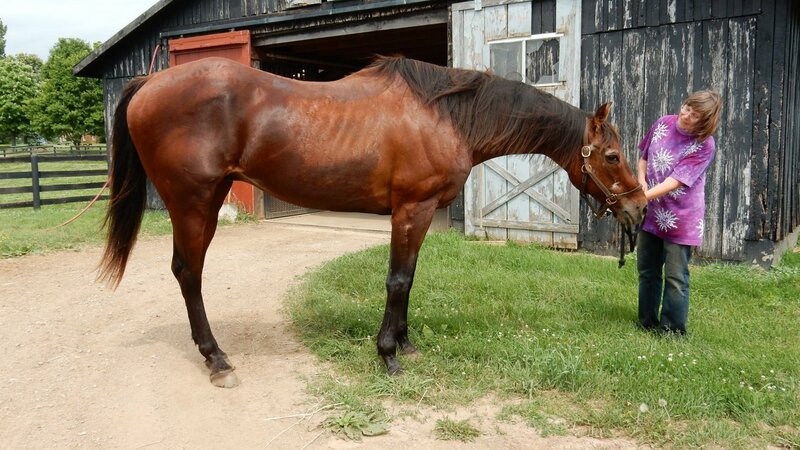 Several people contributed much to Prized’s quality of life at the end, giving him baths that cheered him up, making sure he got the extra attention he wanted, lunches from a hand-held bucket that encouraged him to eat, and the excellent, excellent medical care that enabled him to hang in there and enjoy some of the horsey pleasures of life as long as he could. Because that’s what stallions do. Most are hardy stoics. They don’t show weakness, and they don’t give up until the very end. 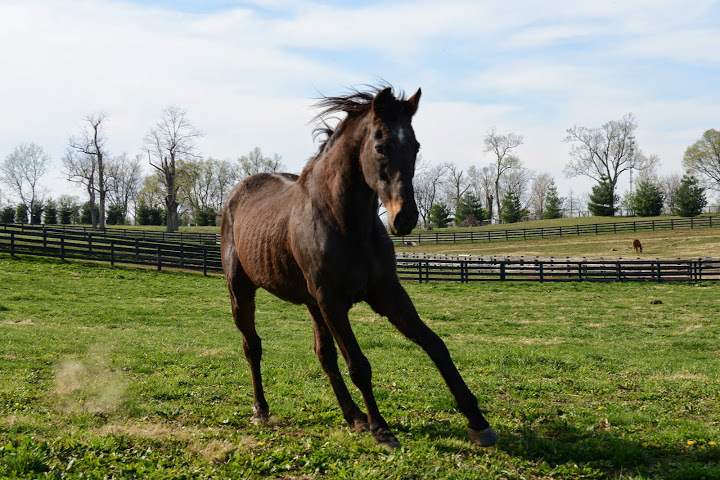 From his arrival in summer 2011, I was struck by Prized’s sturdy, long-legged physique and his independent nobility. He wasn’t a cuddler. He was a bit aloof, a bit tough. When you fed him a carrot he’d often get in a second nip on your palm, just to show you he could. But horses, like humans, are complicated, and Prized threw toughness to the winds when a good scratch was in the offing. Few on the farm got into a back scratch like he did, or made such funny faces of pure scratch-ecstasy. But even when he played along in the impromptu Easter evening “races” (blog entry April 20, 2013), and even though he often ran and trotted just because he wanted to, he ran sort of diagonally. Prized was on our supplements program. The manufacturers of Succeed and LubriSyn, excellent digestive and joint supplements, generously donate enough for some dozen horses to be on daily regimens as recommended by our vets. Most of those horses (the oldest ones, a few with special needs) have put on muscle, gloss and happier spirits than ever. Less so, Prized. His appetite was failing. The hand-held bucket lunches, and extra attention involved, helped his interest in food, but as the old athlete’s physical abilities deserted him, he was sometimes depressed and didn’t always eat the supplements that would help his strength and joint mobility. Staff and volunteers divide the daily supplement preparation and delivery, and I do supplements for designated horses 3 times a week. I mix the particular supplement combination for each horse with a little feed, warm water for some, and carrots (or fruit, for Creator) to make it a treat. Most of the horses on the program come running when I call out the arrival of their “groodle.” I put it in feed tubs that are usually empty, dinner having been served hours earlier. Too often, Prized’s tub was still fairly full of feed, and he’d look, but not come for his treat. Maybe he’d come eat it later, but sometimes not. So I made it the main business of each supplements delivery to get him to eat the nutrients and joint help that would boost his energy and mobility. I’d coax him over, a carrot or two for a step or two. Since walking was sometimes difficult for him, I put it in a bucket and took it to where he was in the paddock. I’d stay talking to him and stroking his neck till he finished, since he seemed to like those little extra signs of companionship. As Prized’s body failed him, his pride never waned, but he let us know he wanted our company and caring. In return, he gave us trust and kindness. His last weeks, Prized had an upswing. He trotted over to see people or get meals. He waited near his feed tub when he saw meals or supplements coming. It was his little game to keep eating his “groodle” for as long as I kept an arm around his neck, or rubbed his forehead and talked to him. It was a stallion thing. He had me where humans belong, at his beck and call. Sometimes he’d eat down past the supplement to finish his dinner, too. My care for Prized wasn’t different from the care some of his other friends gave him. Others did more for him in his last months, and I expect he gave all of us gifts we will never forget. When a horse as proud and noble as Prized lets you in, you can’t help loving him. You can’t help entering his time, where past and future don’t matter. There’s only the moment. I’m grateful to Prized for the moments he let me share with him. Last week the time came that we’d been dreading. His activity and spirits ebbed. It got harder to coax him to eat. The attention and loving seemed to matter, maybe more than ever, but you could see in his eyes that the will to keep fighting was gone. On Sunday morning, Prized couldn’t get up. He tried, but he just couldn’t. He let us know his time had come. Prized went in peace. Before he did, he raised his head, had himself a last farewell nibble of good grass, then laid his head down again. He’d had a good and long life. He’d done more than anyone can expect or hope from a horse. And at the end, Prized know how much he was prized. Here’s Prized winning the 1989 Breeders’ Cup Turf.